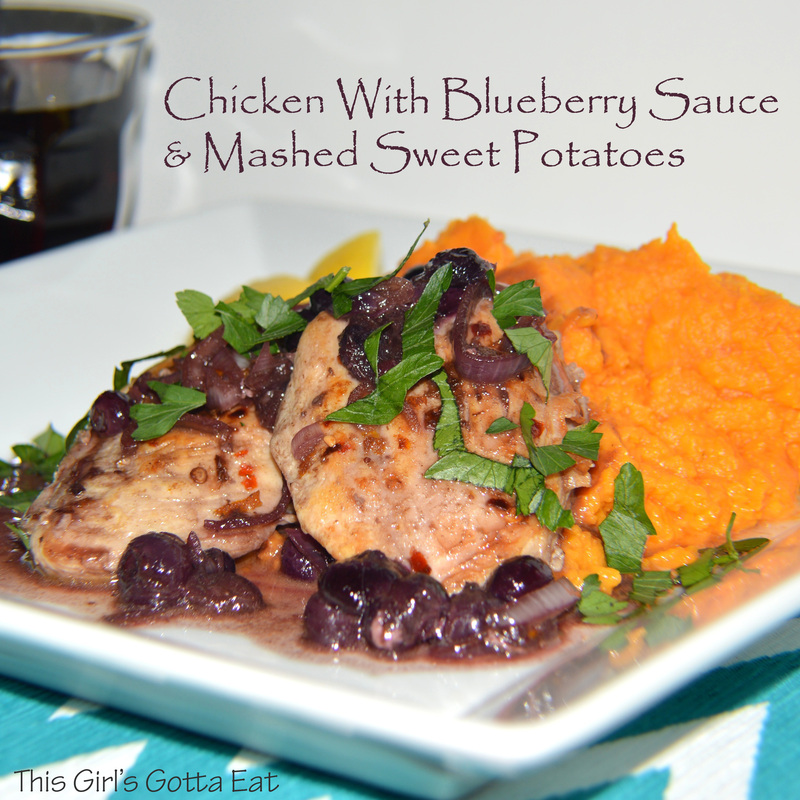 Chicken With Blueberry Sauce and Mashed Sweet Potatoes | This Girl’s Gotta Eat! This is such a gorgeous meal, I mean look at those colors! I love food that is visually stunning like this, and was excited to whip this up when I saw it in one of my latest issues of Cuisine at Home. And I really do mean whip up – this is a perfect, speedy supper recipe for a busy weeknight. Place diced sweet potatoes in a large pot of cold, salted water and bring to a boil (cover with a lid to bring to a boil faster). Continue to boil for 10 minutes until tender. Drain and return to the pot. Cook and stir for another minute over medium heat to dry them out. Mash sweet potatoes with 1 Tbsp butter and lemon juice, using a masher or immersion blender. Season with salt and pepper to taste. While the potatoes are boiling, work on the chicken. Cut chicken into cutlet-size pieces (cut in half horizontally) and season with salt and pepper, or red pepper flakes and a little orange zest. Saute chicken in olive oil in a large saute pan over medium-high heat until cooked through, a few minutes on each side. Transfer to a plate, cover with foil and keep warm. Add shallots to the same pan and saute for a minute, stirring constantly. Deglaze the pan with wine and simmer until almost evaporated. Stir in blueberries, broth, vinegar and brown sugar – bring to a boil then reduce heat to medium and simmer until blueberries begin to burst and sauce thickens, about 2-3 minutes. Remove from heat and stir in 1 Tbsp butter, then season with salt and pepper to taste. I also added a pinch of fresh orange zest right at the end. The sauce was a little thin, so next time I might not use as much broth. It will also thicken a bit if you let it sit for a minute or so before serving. To serve, divide the mashed sweet potatoes among plates, top with sauce, following by the chicken and a little more sauce. Garnish with parsley and lemon wedges if desired. Enjoy with a glass of the wine you used to cook with!